I’m grateful to Marc and Amy Stumbo, who captured this great review of two new Columbia Harbour House menu items in Disney World’s Magic Kingdom! As AJ noted last week, several of the Magic Kingdom quick-service dining locations have recently gotten some additions to their respective menus. When asked if I was willing to do a guest review of some additions to the Columbia Harbor House menu, I leapt at the chance for fame and fortune. While I now realize that neither of those outcomes are likely, the food was still worth writing about. New menu outside. 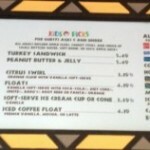 Not pictured: cast member confused by my desire to photograph this menu. 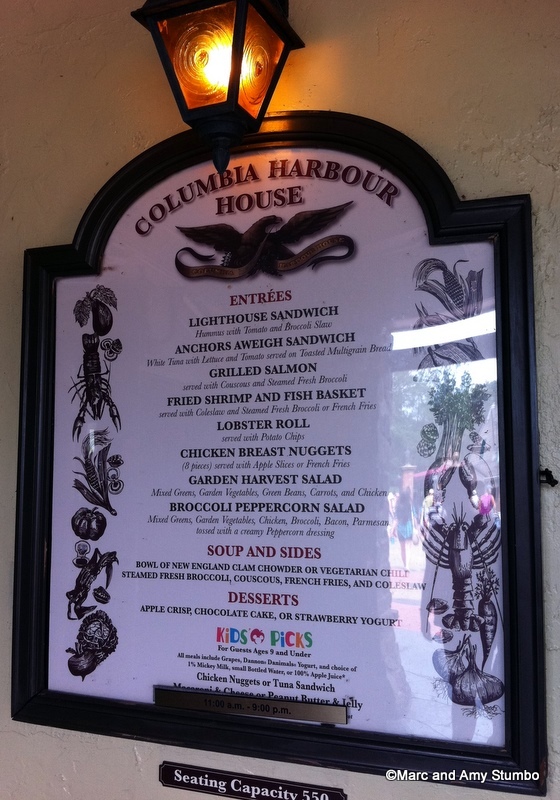 The Columbia Harbor House is located in the Magic Kingdom’s Liberty Square just around the corner from the Hall of Presidents and across the path from the Haunted Mansion. I’ve always loved this corner of the park for its ties to our nation’s history, the superb attention to detail on the overall theme, the kinetics of boats coasting by, and the nautical theme carried into the restaurant. 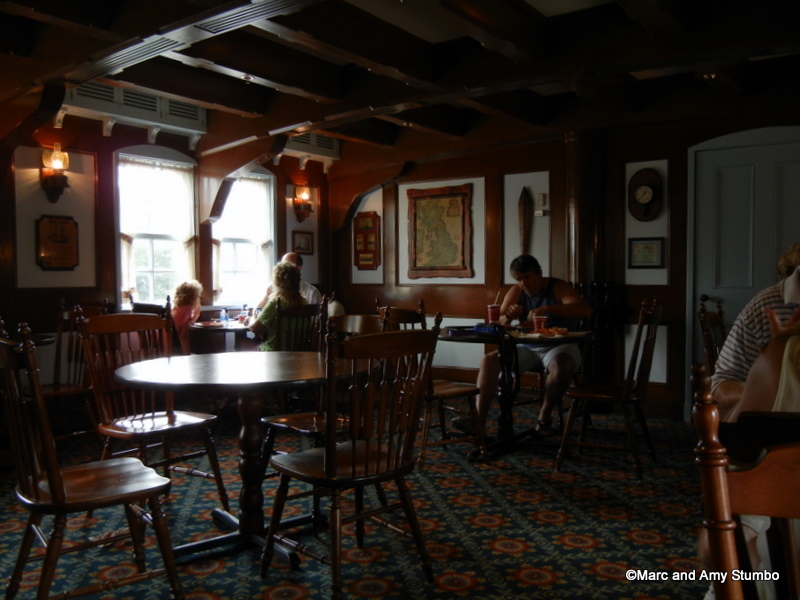 Check out this guest review of the theme inside the Columbia Harbor House if you are looking for additional information on this detailed eatery. Sadly, not everyone can appreciate Liberty Square as is evidenced by the conversation I overheard on my way to the Columbia Harbor House that afternoon. Walking from the hub across the bridge into Liberty Square, I passed a couple and their stroller-bound child stopping in their tracks while surveying the view toward the Ferry Boat dock only about 15 feet into the land. The wife turned to the husband and said “Honey, this is all just old stuff [points to buildings]. We should turn around and go back to where all the rides are.” I KNOW… very sad and amusing to us at the same time. Oh well, they will clearly miss out on a beautiful land and some seriously good eats. 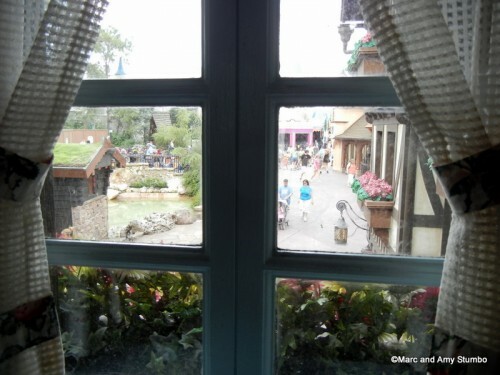 Seating upstairs above the Fantasyland-Liberty Square walkway… during lunch rush. So peaceful. Before getting to the food, I just wanted to say that on this visit I sat upstairs in the portion of the restaurant that stretches across the divide between Fantasyland and Liberty Square. Normally, I wouldn’t have made the trek upstairs and that far around the corner to this relatively secluded location were it not for the recent tweeting of @43SquareMiles (Imagineer Jason Grandt). He clearly liked this location and I can see why with the subtle theme and great views of either land (or both I suppose). Needless to say, I’ll be returning to this location more in the future. The view from my table. Skyway Station is just up there on the left beyond…. Oh, right. I had a hard time choosing which new menu item to review for this article, but in the end I thought to myself “What would AJ do?” and ordered both the Lobster Roll and the Grilled Salmon. First, I’m going to point out that I was just as skeptical, as I’m sure many of you reading this article are, on the potential quality of any lobster-based meal served in a theme park quick-service location for less than $8. Second, I’d like to note that my wife and I recently returned from a weekend trip to Boston for a wedding and during that trip made a pit-stop at a local shop well-known for their lobster rolls because I love lobster and well… ‘When in Rome’. I honestly cannot recall then name of the restaurant we ate at, but it was recommended by several locals and a policeman we talked to, so suffice it to say I have at least some basis for comparison when reviewing this particular lobster roll (albeit a small one). That being said, I can honestly say that this lobster roll was good. It didn’t blow my socks off, but it was definitely delicious and a viable alternative to the theme park lunch staples of burgers, chicken sandwiches, and hot dogs. For starters, I think that given the ingredients, the portion size, and the fact that you are in a Disney theme park the cost is reasonable to say the least. The lobster roll we purchased in Boston was about the same size and cost. The roll was soft and reminded me a lot of fresh Cuban bread which, as a general rule, I love when making a sandwich. However, part of me still wonders if either toasting the bread or using crusty French loaf style bread might’ve provided a nice texture pairing to the soft lobster salad within. Speaking of the lobster salad, I was surprised to find large chunks of lobster meat mixed with fresh cut onion, red pepper, celery, and spices. 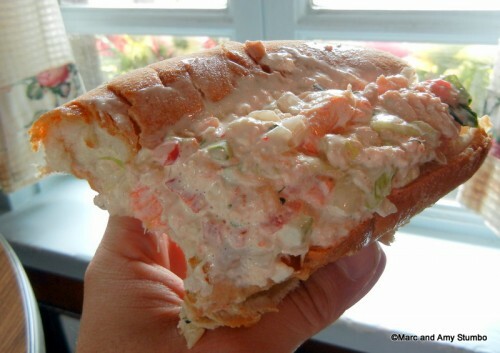 The fresh vegetables provided the much needed crunch and bite to offset the sweet lobster meat and mayonnaise combination. The lobster salad I was served did contain more mayonnaise than I would of liked, but it was still reasonable. Since lobster meat can sometimes have a relatively mild and delicate flavor and as such can easily be overpowered, I feel as though the Columbia Harbor House did a pretty decent job of balancing the lobster meat with the other ingredients to maintain the integrity of the dish. My only suggestion to Disney on this dish would be to provide a lemon wedge for guests to squeeze over so as to provide the much needed acidity many seafood dishes crave. Overall, I feel as though the lobster roll was a delicious addition to the quick service dining options at the Magic Kingdom that is filling and won’t disappoint on flavor. The lobster roll was pretty tasty, but the real surprise of the meal was easily the grilled salmon — making me very glad I opted to review two items instead of just the one on this trip. I’m not going to lie and say that I wasn’t as skeptical about the potential quality of the salmon as I was about the lobster roll. I guess subconsciously the idea of grilled salmon, Disney quick service, and $10 weren’t entirely adding up, causing several red flags to start waiving. 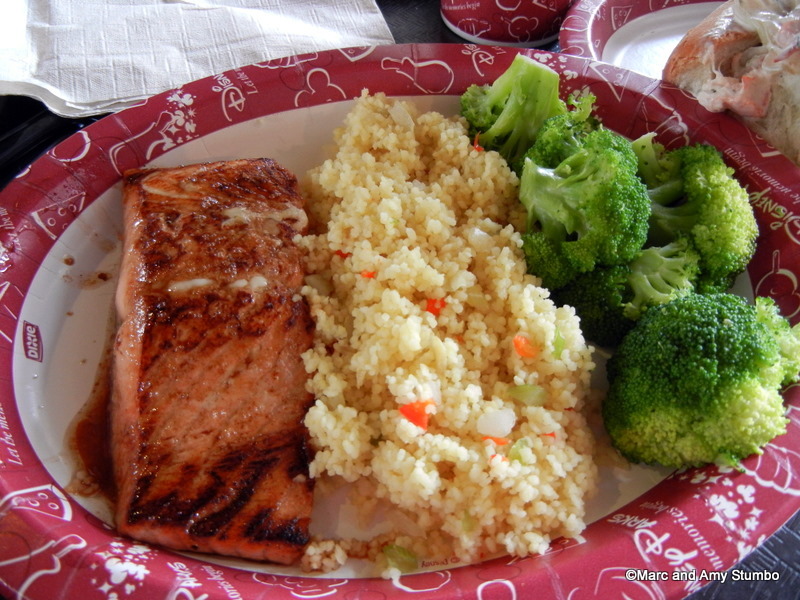 The $10.19 meal consisted of grilled salmon served with couscous and steamed fresh broccoli. I’m glad to say that the meal I got that afternoon contained perfectly cooked salmon: warm, moist, juicy, well seasoned, and a nice light grilled flavor. The salmon was tender and flaky like you would expect and, though not noted on the menu, lightly covered in a white balsamic vinaigrette glaze that added a lot of flavor while still allowing the salmon to shine through. Grilled Salmon… this meal belongs on a real plate. I was afraid that ordering in the rush of midday that the salmon might be served too dry from being cooked en masse to meet the demand, but it tasted like it was cooked to order. The couscous contained a vegetable medley and was also cooked to my liking — it was seasoned well and contained a lot of flavor that accompanied the salmon quite well. Additionally, the couscous was particularly handy in sopping up the delicious balsamic vinaigrette glaze melting off of the hot salmon. Lastly, the meal had a side of steamed fresh broccoli that was a nice addition, but just a little under-steamed for my tastes. I’ll admit that the broccoli was still good (though some butter would’ve been nice or, dare I say it…, plastic cheese? haha) and that maybe I like my veggies a little more steamed than the average person, so your mileage may vary on this one. The combination of the couscous and broccoli was a welcome departure from your usual side options of chips or fries and just as filling if not more (and surely lower on sodium). 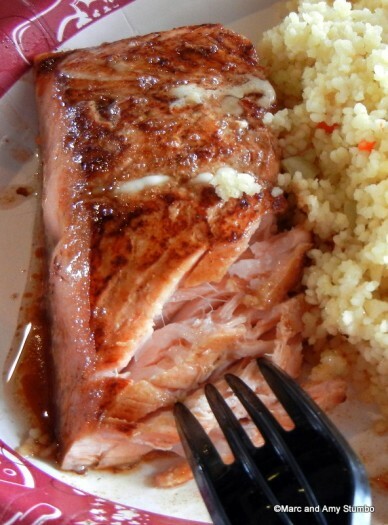 Overall, I’m definitely ordering the grilled salmon again the next time we are eating in the Columbia Harbor House. This meal really came together in terms of flavor, side options, price, portion size, and execution. If you are looking for quick service meal in the Magic Kingdom that feels more like a full service meal, this is your ticket. As always, feel free to follow our journeys in and around Disney via @PlazaAndMainSt on twitter. We hope to see many of you at this year’s WDW Foodie Fest during the Epcot International Food & Wine Festival. Yummy, yummy, yummy! Columbia Harbour House is one of my favorite places in the Magic Kingdom. It always makes me sing “A Whale of a Tale” from the film “20,000 Leagues Under the Sea,” and sometimes I do sing it, clear and bold, which amuses some and embarrasses others (many others). The people you mention who wanted to turn back from Liberty Square and go back to the “rides” reminds us that, with regard to Disney parks, there are two kinds of people in the world: those who get it and those who don’t; that difference lies mainly in the ability to distinguish between a theme park and an amusement park, and you’d be surprised (maybe you wouldn’t) by the number of people on whom the distinction is utterly lost. As you can see, in addition to my ability to belt out a sea shanty, I am a confirmed theme park snob. I’ll definitely be eating here on my next visit to Disney! Wow! I’m super-excited about the Grilled Salmon! Can’t wait to try it for myself in November! Thanks for the review! I was very curious about the quality of the lobster roll. 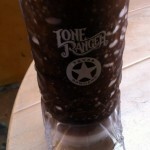 Now that I know it’s pretty good, I might just have to try one on my next visit to Magic Kingdom. So happy to have this review before we head back down. We ALWAYS eat lunch here (and almost always sit at the exact table where the picture was taken) 15 years and counting now! I am a vegitarian and always enjoy the chili~but my hubby will be excited to see the new offerings! I leave 3 weeks from today and this is definitely on my must eat list. Thank you for sharing! I have 5:00 ADR for Tony’s Town Square but I may go the seafood route instead! Awesome article! It was hilarious from the beginning. And it is a great review. 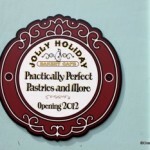 I’m really looking forward to trying both dishes when we go in January! This is my favorite quick service spot so I’m excited to try these new options!! You didn’t mention anything about how long you waited or how crowded it was? While we really, really want to try this out, I’d rather have a sit down reservation somewhere if there is going to be a really long wait for CS. We had that happen once and it kind of ruined the day – we were hungry and couldn’t get anything to eat for a long time, and it was sub par to boot. Right now we have a sit down reservation at The Plaza, but would much rather eat this CS food if it’s not going to be a super horrible wait! Let us know how that went! Thanks for the GREAT review!! But regarding the food, I’m not really a big seafood fan, but this review definitely makes me want to try both of those dishes! I am curious to get more information on the sourcing for the lobster and the salmon in these two dishes. I’m heartened by the non-fried alternatives being offered, but I am one of those people who uses her Monterey Bay Aquarium sustainable seafood app before buying/eating fish. Stephanie, I know Brian Piasecki over at Cali Grill mentioned that Disney’s been working under the Monterey Bay Sustainable Fish rules for their ordering. Pretty sure this includes counter service as well as table service. Can’t swear on it tho. Columbia Harbour House is a favorite of ours and often hard to NOT stop in and choose another location. We love the upstairs area over the walkway (don’t tell anyone its there – its the best seats in the house!) and will only sit there. CHH is great for a full meal or a snack – we often just grab an order of fries and a cup of chowder to share before an afternoon of fun. As for that couple… sadly people don’t give WDW & the parks a real try, missing out on so much. 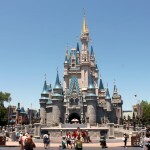 That’s why I always recommend learning all you can ahead of a visit – and why blogs like my friend AJ here on Disney Food Blog, Amanda on Disney Every Day, Rick Howard on Travel with Rick and even our Rori Travels Florida are so important for anyone going to WDW. The World is too big to conquer alone. Thanks for all the great comments. To address Grace’s concerns on how long the wait time was, it wasn’t bad at all. Like I noted above, I went at a pretty high traffic time of day and still only experienced a relatively short wait. They took my order almost immediately at the kiosk and i waited probably 3-5 minutes for my food to come out. I honestly don’t recall waiting much at all. This is good news. 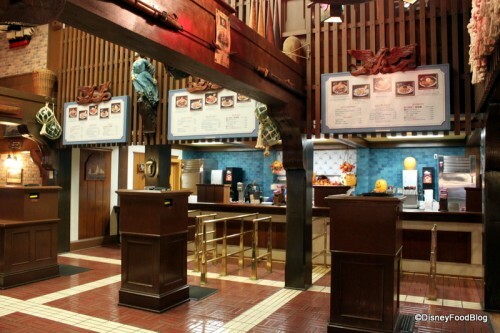 Kudos to WDW food service management for making changes to an already popular restaurant. Usually when places are successful no one makes changes. Eventually that is a mistake. Good for them and I hope to see this happen elsewhere. CHH is always our go-to place for lunch in the MK. I can guarantee we’ll be there again in October and I will be having some lobstah. 😉 My daughter will be excited about the broccoli. No, really, she will! Also a favorite of mine when in magic kingdom, especially the upstairs portion which I feel is a bit more relaxed. I cannot wait to go back and try these two delicious meals! Can you sub broccoli as the side with the lobster sandwich? Great review! We’ve never eaten here, but I’m definitely going to keep it in mind. The salads and sandwiches look yummy too. Definitely a nice alternative to burgers and fries. Thanks for the tip on where to sit. I did not even know that there was an upstairs! Our favorite lunch stop in MK! We love the Anchors Away and Lighthouse sandwiches, and we find this is a nice break from fried everything–although our son loves that he can get chicken strips here. I usually eat the CS salmon dinner at our resort (All Stars) two or three times per trip, and have found it to be comparable in quality to Applebee’s, Chili’s, etc. But amazingly, it’s cheaper! We definitely will be trying the new menu items in December. Thanks for the informative and amusing review. I was disspointed that the chicken and fish combo had been taken off the menu as i was planning to try it, but the salmon looks awesome and makes up for it! I cant wait to try it when we vist. 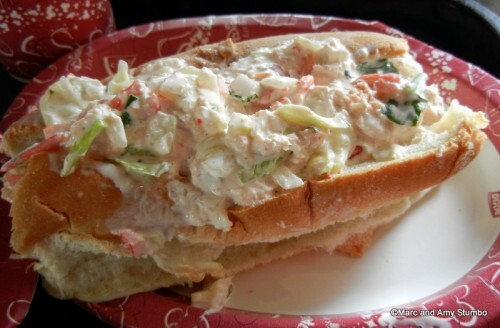 Sorry – it’s just not a genuine lobster roll if the roll isn’t toasted. That was my thought exactly and I don’t even eat seafood! But being from New England seeing that raw roll was just wrong! I don’t touch seafood.. but my parents and sister tried the lobster roll at the Tomorrowland Terrace in June.. they weren’t so impressed (my sister thought an $8 would be the same as a $14 from some fancy schmancy restaurant)- I wonder if it’s the same exact stuff moved down the street or if it’s different.. glad the place got good reviews! Might have to go try a fancy salad and eat it upstairs.. Thanks for this! I’m also really excited about the salmon – I’ve noticed that WDW has added so many more healthy quick service options, and I can’t wait to try them in Oct! The roll not being toasted was my chief complaint with the Lobster Roll as well. It would have made the whole dish come together a bit more. For crying out loud don’t tell people about the Fantasyland bridge! It’s small and I would love to see it remain as empty as possible. As an New York/New Englander, I feel I must pull my regional food snob card and say no way will I eat a lobster roll made at a quick service location in a Florida theme park that doesn’t even bother to toast it’s rolls. They did remove the fried fish + chicken option, but they ADDED a fried fish + shrimp option! Which IMO is way more interesting anyway 🙂 I’m excited to try all of these new menu items! I too would pick the salmon meal. The combo is great. Under-steamed veggies are the way to go actually… kind of the Chinese way. I was just there on Sunday and had lunch. Wanting to try a lot of different things, my mom and I always chose two different entrees and shared them. We had a late lunch just as people were lining up for the parade, so it was fairly quiet inside which made me happy. Also, it was nice and cool. There is a bathroom inside the restaurant which is handy when you are traveling with a 4 year old with a bladder the size of a pea. We got the aforementioned lobster roll and it was pretty good and different from the standard park food. But the best thing we ordered was the broccoli peppercorn salad, which is also new. It was full of fresh veggies, including corn. The chicken topping the salad was flavorful, and the dressing was excellent. It was probably the best lunch I had. 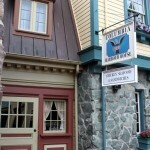 We will definitely be going back to Columbia Harbor House on our next trip! 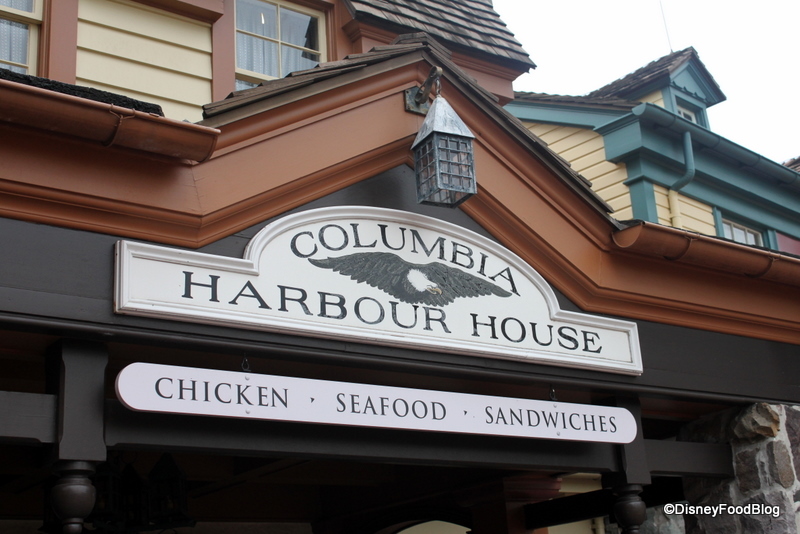 Columbia Harbour House is our favorite CS….you had me at Lobster Roll 🙂 GREAT review!! I just wanted to add, as I read someone mentioned other options for decent, or even excellent, seafood at cs places. I am not a huge seafood person but my bf is. He had the salmon and egg sandwich at the Norway cs. It is known for its bakeri but he LOVED the salmon and egg sandwich and still talks about it. He also had the lobster roll at CHH and was quite satisfied with it, but he raves about the Salmon and egg sandwich. We eat at Columbia house every time we are at Disney world magic kingdom. The food is always good, but this time I was very disappointed that the previously delicious clam chowder was watery and tasteless. What happened? Just ate there the first week of December 2013 and had the salmon. Awful. No perceptible balsamic stuff, just oily generic grill grease. And the fish tasted off! As in too old or left sitting out too long. Couscous was salty to the point of inedibility. Broccoli okay. I seem to remember that many of the items on that menu were either fried or saturated in mayonnaise or oil. I found that finding edible, healthy food at counter-service places (sit-down was reserved up) at WDW was a real challenge. WHERE exactly did you get a lobster roll in boston for ten dollars?!? Because I live here and I need to know now.